I'm Neil...and ewe are ? Yesterday I had a CT scan.....trying to get to the bottom of my ear related woes......what's the difference between a CT scan & a MRI scan ? I gather a MRI is far more intense but how do these scan things work ? Also, I was the only one out of 6 people whop was having a CT scan.......WHY did all the others have to drink a whole jug of water before their MRI scan ? Re: What is the difference between a CT Scan and an MRI scan? CT is the same as CAT or Computerised (Axial) Tomography -this is basically a sophisticated X-ray, in 3D. MRI is Magnetic Resonance Imagining, previously known Nuclear Magnetic Resonance, until people started thinking one should not have the word Nuclear in anything. MRI immerses you in a massive magnetic field, and then flood you with radio waves, and try and work out what strength of magnetic field will cause the nuclei to resonate at which radio frequencies, and so judge which chemicals exist within a locality of the body. A computed tomography (CT) scanner uses X-rays, a type of ionizing radiation, to acquire its images, making it a good tool for examining tissue composed of elements of a relatively higher atomic number than the tissue surrounding them, such as bone and calcifications (calcium based) within the body (carbon based flesh), or of structures (vessels, bowel). MRI, on the other hand, uses non-ionizing radio frequency (RF) signals to acquire its images and is best suited for non-calcified tissue. CT may be enhanced by use of contrast agents containing elements of a higher atomic number than the surrounding flesh (iodine, barium). Contrast agents for MRI are those which have paramagnetic properties. One example is gadolinium. MRI can generate cross-sectional images in any plane (including oblique planes). CT was limited to acquiring images in the axial (or near axial) plane in the past. The scans used to be called Computed Axial Tomography scans (CAT scans). However, the development of multi-detector CT scanners with near-isotropic resolution, allows the CT scanner to produce data that can be retrospectively reconstructed in any plane with minimal loss of image quality. Both T1-weighted and T2-weighted images are acquired for most medical examinations; However they do not always adequately show the anatomy or pathology. The first option is to use a more sophisticated image acquisition technique such as fat suppression or chemical-shift imaging. The other is to administer a contrast agent to delineate areas of interest. A contrast agent may be as simple as water, taken orally, for imaging the stomach and small bowel although substances with specific magnetic properties may be used. Most commonly, a paramagnetic contrast agent (usually a gadolinium compound) is given. Gadolinium-enhanced tissues and fluids appear extremely bright on T1-weighted images. This provides high sensitivity for detection of vascular tissues (e.g. tumors) and permits assessment of brain perfusion (e.g. in stroke). There have been concerns raised recently regarding the toxicity of gadolinium-based contrast agents and their impact on persons with impaired kidney function. Special actions may be taken, such as hemodialysis following a contrast MRI scan for renally-impaired patients. More recently, superparamagnetic contrast agents (e.g. iron oxide nanoparticles) have become available. These agents appear very dark on T2*-weighted images and may be used for liver imaging - normal liver tissue retains the agent, but abnormal areas (e.g. scars, tumors) do not. They can also be taken orally, to improve visualisation of the gastrointestinal tract, and to prevent water in the gastrointestinal tract from obscuring other organs (e.g. pancreas). Diamagnetic agents such as barium sulfate have been studied for potential use in the gastrointestinal tract, but are less frequently used. In clinical practice, MRI is used to distinguish pathologic tissue (such as a brain tumor) from normal tissue. 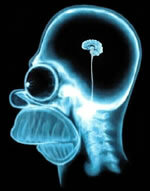 One advantage of an MRI scan is that it is harmless to the patient. It uses strong magnetic fields and non-ionizing radiation in the radio frequency range. Compare this to CT scans and traditional X-rays which involve doses of ionizing radiation and may increase the risk of malignancy, especially in a fetus. While CT provides good spatial resolution (the ability to distinguish two structures an arbitrarily small distance from each other as separate), MRI provides comparable resolution with far better contrast resolution (the ability to distinguish the differences between two arbitrarily similar but not identical tissues). The basis of this ability is the complex library of pulse sequences that the modern medical MRI scanner includes, each of which is optimized to provide image contrast based on the chemical sensitivity of MRI. For example, with particular values of the echo time (TE) and the repetition time (TR), which are basic parameters of image acquisition, a sequence will take on the property of T2-weighting. On a T2-weighted scan, fat-, water- and fluid-containing tissues are bright (most modern T2 sequences are actually fast T2 sequences). Damaged tissue tends to develop edema, which makes a T2-weighted sequence sensitive for pathology, and generally able to distinguish pathologic tissue from normal tissue. With the addition of an additional radio frequency pulse and additional manipulation of the magnetic gradients, a T2-weighted sequence can be converted to a FLAIR sequence, in which free water is now dark, but edematous tissues remain bright. This sequence in particular is currently the most sensitive way to evaluate the brain for demyelinating diseases, such as multiple sclerosis. The typical MRI examination consists of 5-20 sequences, each of which are chosen to provide a particular type of information about the subject tissues. This information is then synthesized by the interpreting physician. GEORGE..THANK YOU VERY MUCH.......wonderful information. LOL LOL HOMER!!!!!!!!!!!!!! LOL LOL LOL LOL!!!!!! Yepp! That's funny! LoL. I hate MRI's. I sat in one for over an hour. Not moving at all. It stunk!. I've had lots of X-Ray's and no CT scans. Thanks for posting this I've always wannted to know! My CT Scan only lasted a couple of minutes...it was quite fun...I wanted to go again !! I like the spinny turny thing !! My cat scan took about ten minutes and my MRI Took all total AROUND 25 TO 30 MINUTES.. It was like having a jack hammer pounding above my head with the ear plugs and the headphones it was still loud.. he forgot to turn the music on until about half way through the procedure...LOL Then I could barely here that over the pounding and the ear phones..
HAHA Karen! I was sitting in there for an hour with those things moving and I don't think I had ear plugs in. lol. And I wish I would have had a CT scan. Cat scan was relatively quiet in comparison! Plus the spinny thing. Done Deal! LoL. Why is there a gap between some of the replies? Am I the only that has it? You have to open it up. Use your shrink button to your right some comments are shrunk if they are "pointless comments " Just chit chat! Did ewe guys and gals have to drink lots of water for your MRI scans ! ? I did not as it was for my shoulder and arm.. I think it is different if its a full body scan for some reason.At least on the MRI..! They have these weird little cocktails which I believe allow them to see other things maybe digetion system or something.. I am not sure! It's only because all the others who were waiting had to drink this whole jug of water !....they were MRIing..I was CTing! !....I just can't imagine that all 5 had the same condition requiring all that luffley H20 ! Thanks Karen and Neil I didn't have any water. Well It has been many years ago but they made my mom drink a lot of something.. I don't think it was water though right before her MRI.. Could have been , but I thought it was something else.. LOL who knows.. I do know about the barrium thingy.. That is the chalky tasting thing is it not? Magnetic Resonance Imaging (MRI) is a medical imaging technique used to take pictures of the lungs, structures of the body and organs. It can provide detailed visuals of the body in any plane. The advantage of using MRI over Computed Tomography (CT) scans is that MRI scans provide greater contrast between different tissues of the body making it easier to detect malignant cancerous cells & tumors. Thanks and welcome to the forum cocojambo! Page created in 0.155 seconds with 81 queries.